The 2019 Harley-Davidson® Softail® Fat Boy® motorcycles are for sale at Latus Motors Harley-Davidson®. If you are searching for a bike that satisfies your soul, visit our motorcycle dealer near Portland. The new Fat Boy® boasts an iconic Softail® frame, steamroller stance, and satin chrome finishes. Adjust the high-performance rear mono shock to your preference and attack the horizon. The Fat Boy® is immediately recognizable by its solid-disc Lakester wheels. The 2019 model comes with a 160mm front tire that is the largest tire ever offered by the Motor Company. The fat rear tire earns its name coming in at 240mm. The 2019 Softail® models are a tribute to their predecessors while offering a new lightweight design that creates a responsive ride. To introduce yourself to the full assortment of 2019 Harley-Davidson® motorcycles, schedule your test ride with our Harley® team today. The 2019 Fat Boy® is accented by an abundance of satin chrome finishes set in a steamroller stance. The fat front tire accents the muscular look. The heart and soul of any Harley® is the Milwaukee-Eight® Big Twin engine. For 2019, the Fat Boy® is available in both 107 and 114 engine displacements. Regardless of what motivates you, a soul-satisfying rumble will be along for the ride. For day trips that dip into the night, signature LED forward lighting will light the road ahead. This powerful front headlight offers great nighttime visibility and alerts other drivers to your presence. To make this new Fat Boy® your own, apply for Harley-Davidson® financing and lease deals. After you are pre-approved for credit, make the short ride from Tigard, Oregon to Latus Motors Harley-Davidson®. An original icon meets a High Output Twin Cam 103B™ engine. Discover the 2019 Softail® Fat Boy®. Vehicles depicted may differ from vehicles manufactured and delivered. Specifications and prices listed may differ from specifications and prices of vehicles manufactured and delivered. All product descriptions (including depictions, specifications, dimensions, measurements, ratings and competitive comparisons) are based on available information at the time of publication. Although such descriptions are believed correct, errors and changes can occur, and complete accuracy cannot be guaranteed. Harley-Davidson® may make changes at any time to prices and specifications, and may change or discontinue models, without notice and without incurring any obligation.Attention: Vehicles in the configurations shown and many of the accessories described in this catalog may not be available for sale or use in some locations. Please check with your dealer for complete product details and the latest information. 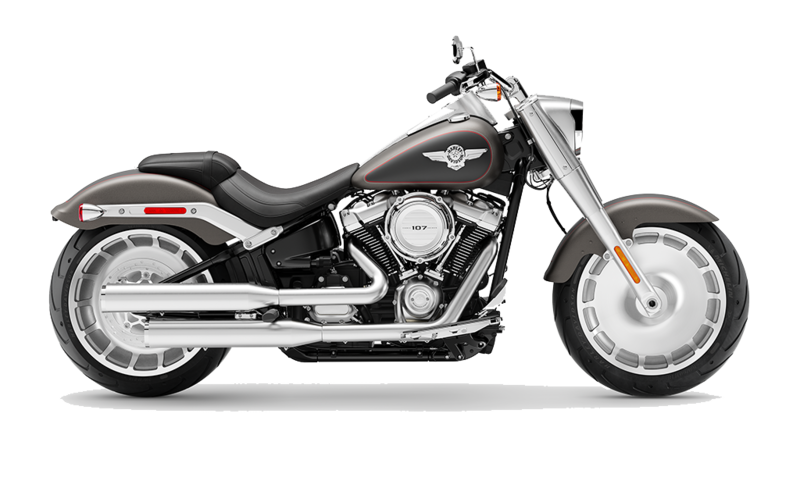 All models feature 6-speed transmission (V-Rod™ models and Sportster® models are 5-speed) and carbon fiber belt final drive; multi-plate clutch with diaphragm spring in oil bath; and 2-year unlimited mileage warranty.